When selling your home you have ONE chance to make a great impression and EVERYTHING counts! Until a buyer really falls in love with your house, they are often see what is “wrong” and how it does not work for them. And then, if they DO fall in love with your house, they start looking for things that will help them pay less for it! When selling your home it is important that you give potential buyers every opportunity to fall in love and remain in love with your house; while you minimize areas that could create cause for negotiation. 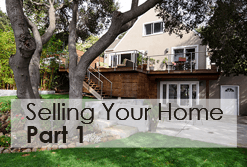 In this series we look at 12 Tips – For Selling Your Home. I know what gets homes sold here in San Francisco and the Peninsula, and understand what sellers need to do in order to see top dollar and multiple offers. The information in this series is meant work wherever you live. If you live in the San Francisco Bay area and have additional questions, you are always welcome to give me a call. If you live elsewhere in the country, check with a top-agent in your area about where to start and what of this holds true for selling your home – Each market varies. It takes work to get top dollar for your home and these 12 Tips are a great start! The tips are in no particular order and do not take into account the specifics of your home. The Best Tip for your home may be, “do a kitchen or bath renovation!” These tips for selling your home are meant to get you started and help you choose an agent who can get your home SOLD! In Part 1 of this three-part series on selling your home, we look at the first two tips Curb Appeal and Closets. When selling your home, curb appeal (how it looks from the street) and home-staging (the intentional arrangement of furniture and decor in a way that appeals to potential home-buyers) definitely matter. Potential buyers begin to judge your home as soon as they can see it from the street. From that first moment on, you need to woo them! You want your home to feel safe, inviting, fresh, clean, spacious, well-organized and livable. We have additional blog posts that go into the specifics of both curb appeal and staging, and I will make sure to share those at the end of the series so you can get the full picture. Home-buyers love to see storage space in a home. When selling your home, keep in mind that half-empty closets, kitchen cabinets and storage areas make those spaces look BIGGER than they are! Remove HALF of what’s there and organize the rest. Use this as an opportunity to purge before you move and make your closets, cabinets and storage spots more appealing at the same time! If it has a door, buyers will definitely open it and take a look inside, so make sure to keep those clothes closets, linen closets, hall closets, storage closets, kitchen cabinets and pantries neat and in good order the entire time your home is on the market. I encourage you to check back in two weeks for the next post in this series: Selling Your Home 12 Best Tips – Part 2, where we look at ways to brighten your prospects when selling your home!